Time for another review of a specific type of jacket. This new selection of eight jackets was done with one activity in mind: camping. Nature lovers unite! We are in the perfect camping season and it only gets better from now until Autumn and rain are back. 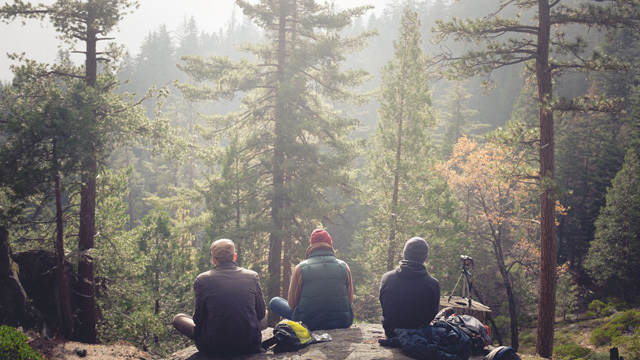 Now, those that are just getting started and have been invited on a camping trip or would just like to challenge themselves and experience nature in its entirety, are very welcome. Apart from taking a look at the eight jackets we have chosen, we will also be learning a few things about camping jackets. How to choose them and what is a must when looking to buy one? We will get started right away. What Is a Camping Jacket? 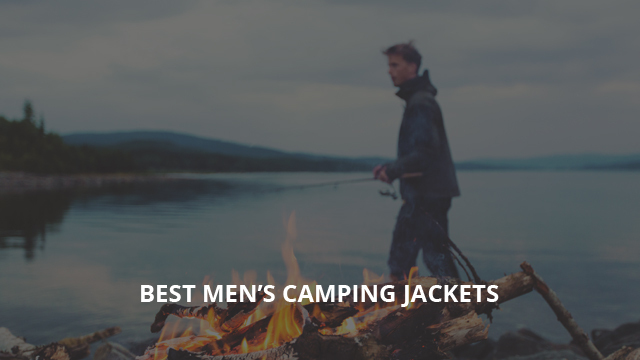 Technically speaking, a jacket designed solely for camping does not really exist. However, there are outdoor jackets, specifically those for hiking and other outdoor activities, which make great camping jackets. Why is that? Well, because usually camping is not just one activity. Avid campers are more often than not avid hikers as well. They walk for hours in long trails for that perfect camping spot. Others camp when necessary in their outdoor journey. 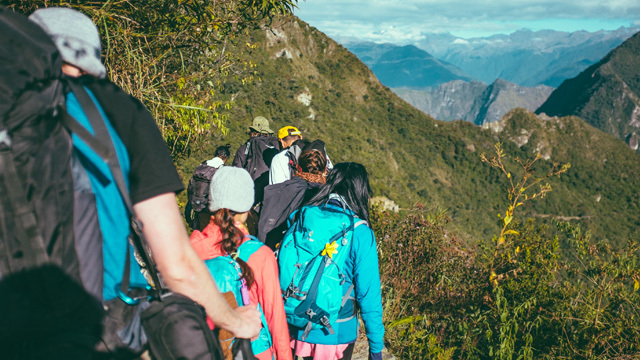 If there were a jacket solely for camping, it would mean another extra piece of clothing to pack and minimalism is essential when travelling in general and even more so when travelling on foot. But what makes a jacket suitable for camping are a few design features that make this jacket a great hiking jacket in the first place, which then makes it suitable for camping too. Depending on whether it is raining, cold or melting hot outside, the jacket of choice will vary accordingly. To keep this short and sweet, if you are taking a long hike before camping or will be outdoors for days or weeks, then you ought to look for a versatile jacket that provides comfort, protection and breathability. While we mentioned in a previous article that high resistance to weather means compromised breathability, if the weather is warm and dry, then opt for breathability over water-resistance. And of course, if the weather will be unstable with temperature changes and possible raining, then turn to a jacket with protective membrane on the outside. These are usually high-performance and breathability won’t be an issue. 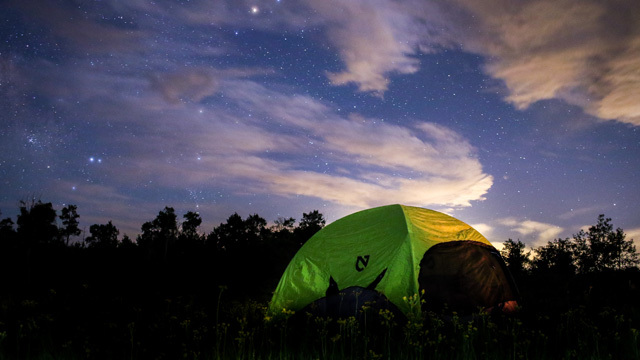 For one-day camping in warm weather you can either choose a waterproof poncho or a lightweight nylon outer jacket, just to be on the safe side. 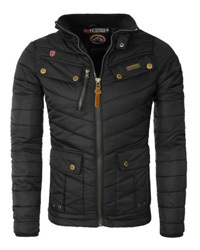 As you will see for each jacket, we will mention what weather they are best suited for, to make it easier. A backpack can only hold so much and when it comes to small belongings, they are best kept in easy-to-reach places. By that we mean pockets. Camping jackets should have at least two side pockets, but the more space there is, the better. We will be including several different types, from those with two outer pockets to others with more. While to some this comes down to preference, just keep in mind… weather. Yes, it is a given but even if you are a short-jacket kind of guy, in cold and windy areas you will fare better with a longer jacket. At least long enough to cover your back when sitting down. See, there is always room for compromise! Now, time to take a look at the jackets themselves. By TACVASEN, this military-like jacket makes a great outdoor asset. It comes with a hooded collar that is adjustable, high and with chin guard. The outer material is 96% Polyester and 4% Spandex for better fitting and ease in movement. The inner lining is 100% Polyester fleece, that is breathable and insulating. 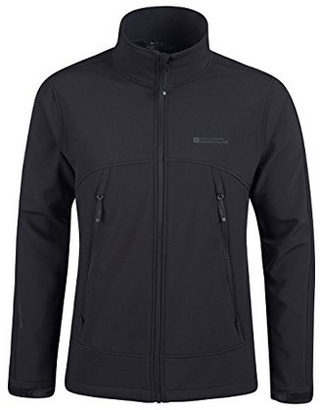 This jacket is best suited for cool/cold weather, seeing that it’s a Softshell. It is high-performance due to the design, but we would recommend to wear it in dry weather if possible. However, it has considerable water-resistance but it will not withstand long showers and heavy raining. There are multiple pockets on the outside, two big ones on the chest, one on the right sleeve, two on the left and two back pockets as well. The cuffs are adjustable with Velcro fasteners and the hem is longer in the back, for better coverage. This softshell comes in many colors: Black, ACU, Green, Grey, Sand, CP, Black python, Green python, Sand python and Tree camouflage. Dover is by Regatta and it is a waterproof jacket made of Hydrafort Polyester fabric. The inside is made of anti-pilling fleece and overall this is a great jacket for cold and unstable weather, but not suited for those who overheat easily as it is not highly breathable. Inside the sleeves there is Thermo-Guard insulation that prevents heat loss and helps maintain warmth. It has Velcro fasteners to adjust the cuffs and comes with a high collar. Stowed under the collar there is a hood. The hem is slightly elastic and the main zipper is covered by a storm placket for added protection. There are two outer pockets, spacious enough for most small belongings. Dover is available in the color Black and Navy. 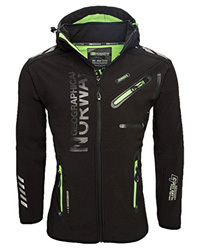 By Mountain Warehouse comes Napier, a practical and lightweight softshell jacket. It is made of 96% Polyester and 4% Elastane on the outside, lined with fleece on the inside. It has a high collar, without a hood and Velcro fasteners on the cuffs. There are two oversized pockets on both sides, which go from the chest to the sides. The lower hem is adjustable for better fitting and for better insulation. 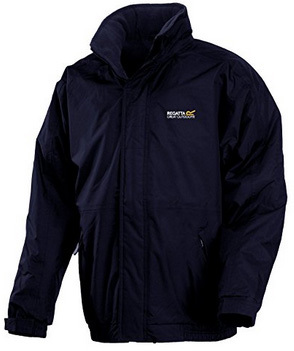 This is a water and wind resistant jacket, suitable for dry weather and mild temperatures. It is available in the color Black and Khaki. 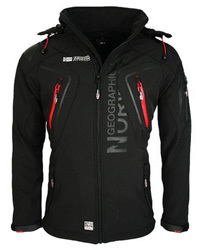 This next jacket by Geographical Norway is a softshell jacket with the classic sports look. The material is 96% Polyester and 4% Elastane and it is water-resistant as well as windproof. This is a very versatile jacket as it is designed for movement and breathability, preventing overheating and guaranteeing performance and comfort. The collar is high and stand-up, with a removable hood in the back, which is adjustable. The cuffs are adjustable and the jacket is a slim fit, enhancing the shoulders and arms. There are plenty of pockets on the outside and one inner pocket. On the outside they are placed on the sides, chest and sleeve, each with water-resistant zippers. The colors available are: Dark grey, Black, Red, White and Blue. Related: Read the review of this jacket here. Thermoball is a 100% Nylon jacket by The North Face. This is a perfect camping and travel jacket as it is lightweight and packs into its own bag. It is a hoodless jacket, suitable for dry weather, but withstands rain fairly well and recommended for cold weather. This is due to the 100% Polyester ThermoBall insulation. ThermoBall is a high-quality insulation that maintains its abilities even when wet and at the same time prevents heat loss. 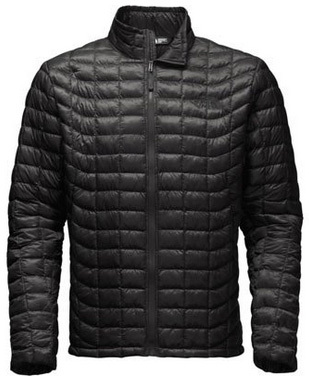 The jacket is quilted in a rectangular pattern, extending on the sleeves too. It has a short collar and standard cuffs. There are two hand warmer pockets on the outside and one MP3 pocket on the inside. It is available in a variety of colors, such as: TNF black, Cardinal red, Bomber blue, Thyme and over 30 more options. 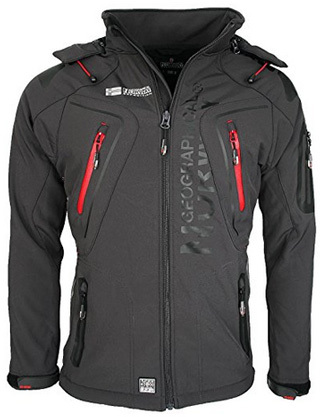 Related: Read our review of this jacket here. 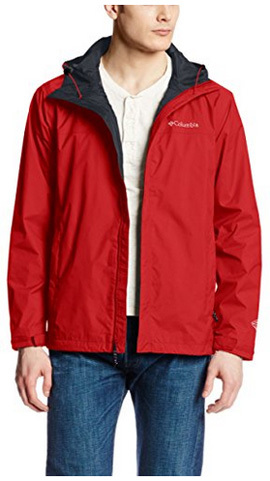 Columbia’s Watertight II is a very lightweight rain jacket. 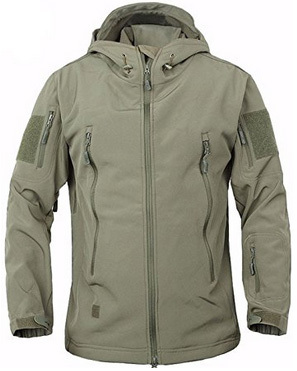 It is a comfortable, 100% Nylon jacket that comes with Omni-Tech waterproof membrane on the outer shell. This not only prevents water from getting in but also allows for air flow and prevents overheating. It has a hooded collar, which can be adjusted. The main zipper is waterproof and also covered. There are two zip pockets on the sides and adjustable cuffs. The inside is lined with 100% Polyester mesh fabric that helps breathability, but makes this jacket more suitable for milder temperatures. It comes in many colors, some of which are: Mountain red, Bright red, Black, Columbia grey, Teal and Zinc. 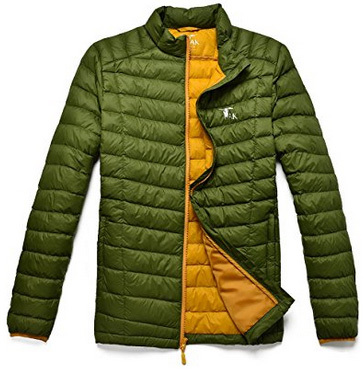 This is a trekking jacket by TAK and not just that. It is also a down jacket. The material is 100% Nylon both in and out and it is also quilted. The fabric is placed in two layers, in order to allow air flow, that provides considerable breathability for a down jacket. 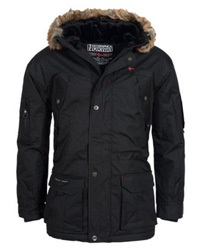 This is a highly rated jacket, with excellent workmanship and is high quality, as well. Apart from all that, it is very lightweight, which makes it comfortable to wear during hiking and camping. 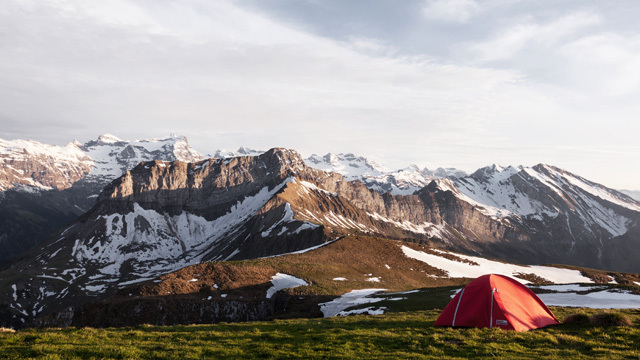 Because of that, it is especially great for camping as it is not bulky either. There are two side pockets on the outside and two inner pockets. The main zipper is covered and the seams are sewn 7 times to guarantee that the filling stays in place. It has elastic cuffs and a short collar, which comes without a hood. The color options include: Black, Aqua, Grass green, Grey and Navy. 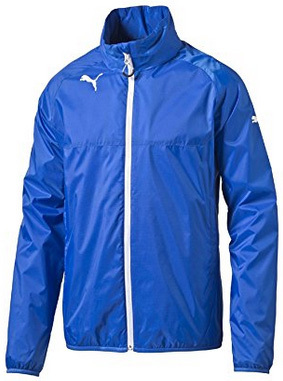 Lastly, not only do we have a super lightweight and comfortable rain jacket, but it is also by a popular brand, Puma. This is a 100% Nylon jacket, with a high collar and a hood that stows away under it. It is simple in design and best suited as an outer layer for added protection against rain. The inner lining is mesh fabric for breathability and this is a jacket for warm temperatures. The zipper is uncovered but water-resistant as are the zippers on the side pockets. It has elastic cuffs and a slightly elastic hem. The color options include: Blue, Red, Black and Puma royal blue.